Spatial designs today all seem to be either made to measure or standardised. Hyper individualism or mass production. Indeed, it sometimes seems that these are the only two options. With the replacement of major ideologies by neo-liberalism, belief in the power of the collective, and hence interest in the design of spaces for collectivities, has disappeared. As a result, people either belong or they do not. They are either in or out. Dividing lines have all become barriers. But a shift is now occurring, and the collective is increasingly viewed differently. New ways of bringing people into contact with one another are emerging within society. Some are permanent, others temporary. Unlike previously, people now choose to affiliate themselves with various groups at the same time. What types of spaces are needed to facilitate collectivity? And how do you stimulate collective behaviour? 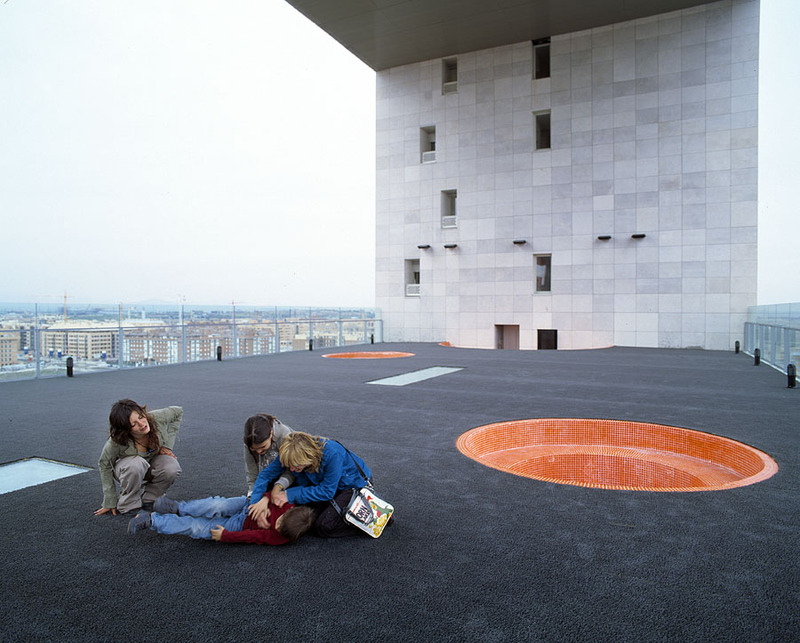 How do you translate collectivity spatially in a big building? And, the Achilles heel of modernist urbanism, who takes responsibility for that collective space? This contribution to the ArchiNed series on the Open Society, and the exhibition about Jaap Bakema at the Dutch pavilion during the architecture biennale, can only start once I have explained something about my youth. From the age of two until I was six I lived in Es, a neighbourhood in the town of Hengelo designed by the office Van den Broek en Bakema. It was a truly modernist urban plan composed of low- medium- and high-rise blocks with clean-lined facades in brick. Pedestrian-friendly public areas, green zones and playgrounds filled the space between the residential blocks. As large parts of the neighbourhood were pedestrian only, the territory where I was allowed to play expanded rapidly. That would not happen in a neighbourhood built today, where you can’t reach the next block without crossing a street. 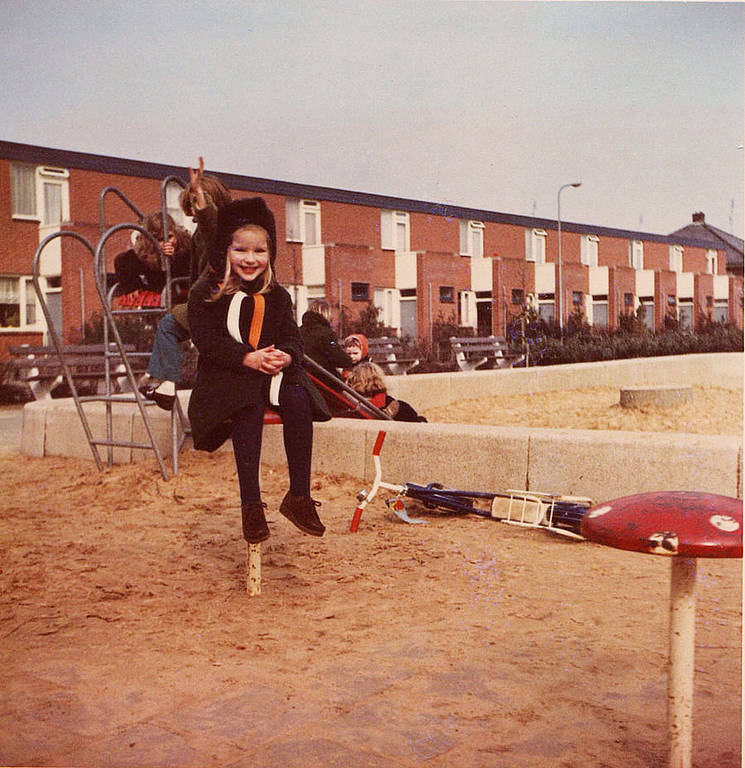 Many of the public squares of my youth were gathering spots for children from the neighbourhood, among them many children of immigrant workers employed in the industries around Hengelo. Public spaces in Es were real places of encounter that attracted parents to sit on benches and were frequented by the residents of both high-rise and low-rise blocks. Front doors opened into gardens along the residential streets, facilitating contact between blocks, in contrast to today’s Vinex neighbourhoods where courtyards are fenced off into private plots and endless streets are lined by cars. The combination of cultural richness and blocks of flats connected to one another in places by footbridges gave Es an urban feel, yet it was also green and close to the woods. Public space between the buildings was a crucial quality of the neighbourhood, as was the careful and clean-lined design. The functionalist proposition of a neighbourhood composition — various age groups in various housing typologies — was unrealistic at the time owing to the rapid growth of Hengelo, the housing shortage caused by the war, and the influx of migrant workers even while the neighbourhood was under construction. The ideal envisaged on paper was never realised, and Hengelo never succeeded in finding a way to deal with this neighbourhood of predominantly affordable dwellings and lots of open space. So by the 1980s, large parts of the neighbourhood had been demolished or drastically remodelled. After all the Dutch experiments with new urban typologies, we have now gone to the other extreme. We build endless seas of suburban terraced houses, with as little as possible of that ‘inconvenient’ public space between the dwellings. Now we have reached a point where we recognise that higher densities and urban quality are indeed necessary in a densely populated country like the Netherlands. But something important got lost along the way. Today we have no vision of shared space as a place for the type of social encounters that used to occur between the modernist blocks, along galleries as wide as streets, and in many small parks. Lack of vision and an inability to supervise and control these collective spaces properly meant that a huge number of them were either closed or built over. Urban design is now often about street walls, block edges, materials and plinths. The first opportunity for MVRDV to escape from the mass scale and monotony of housing construction of the 1970s and ’80s arose with the design of the submission for Europan 2, entitled Berlin Voids (1990-1991). The location was a void in the city, a former border crossing between east and west, with a mixed-use programme. Newly graduated from Bakema’s TU Delft, academically indoctrinated by Bakema’s pupils, and with the ambition to design from a chair to a city, we seized the opportunity to approach the project, a very big residential block with commercial and public functions, not as a traditional apartment complex but as an urban district. The exceptional location, bordering an open space with railway lines on the edge of Prenzlauer Berg, prompted the idea to house the programme in a traditional perimeter building block flipped on its side. The block would acquire the singular character and social life of a horizontal city district, combined with the individuality and views offered by a high-rise residential slab. The plinth and accompanying functions, main floors and attics of the traditional city block would all acquire a place of their own in the new configuration, as would the courtyard and the street. And it had to be a socially mixed building in every sense. Accommodating all this in a slab meant playing around with the widths and heights of dwellings. All the other functions called for their own dimensioning, leading to a box of building blocks with various forms. Some functions could be spatially translated into openings or voids, and these too were distributed across the building. The result was a Chinese puzzle that reflected the desired urban mass and composition. Thought we won first prize, the project was never built. Our office was born, however. Over the years we have clung to the idea of designing collective, semi-public spaces within buildings, even though they are not called for in design briefs. The traditional solution is to position them at the base of the building, possibly extending into the lobby or plinth. With a refined means of access, however, it should be possible to make all areas and some of the contents of a building genuinely public. 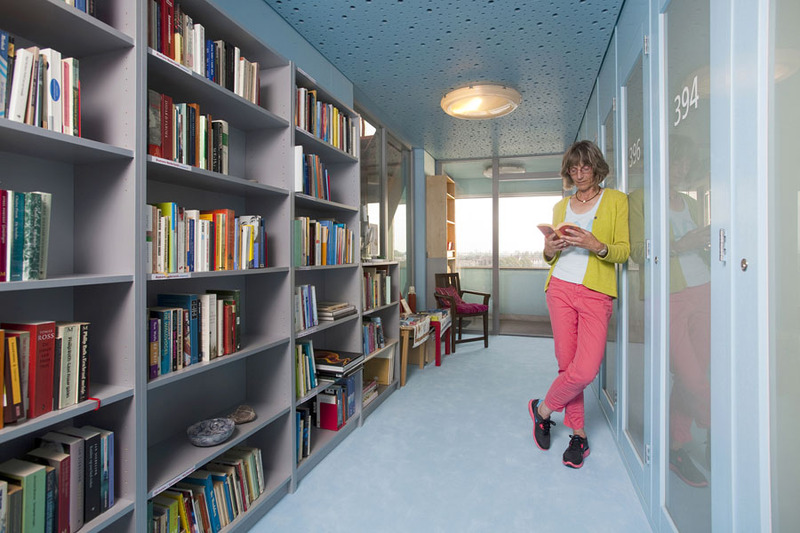 At a time when more and more people want to live in more spacious accommodation within a confined area, an increase in the amount of public space is no luxury but a necessity. The residents of the large residential building make this space available for other city dwellers. Although we haven’t yet managed to realise this in a residential building, perhaps the dwellings that will surround the Market Hall arcade in Rotterdam could be seen as a step on the road towards this development. 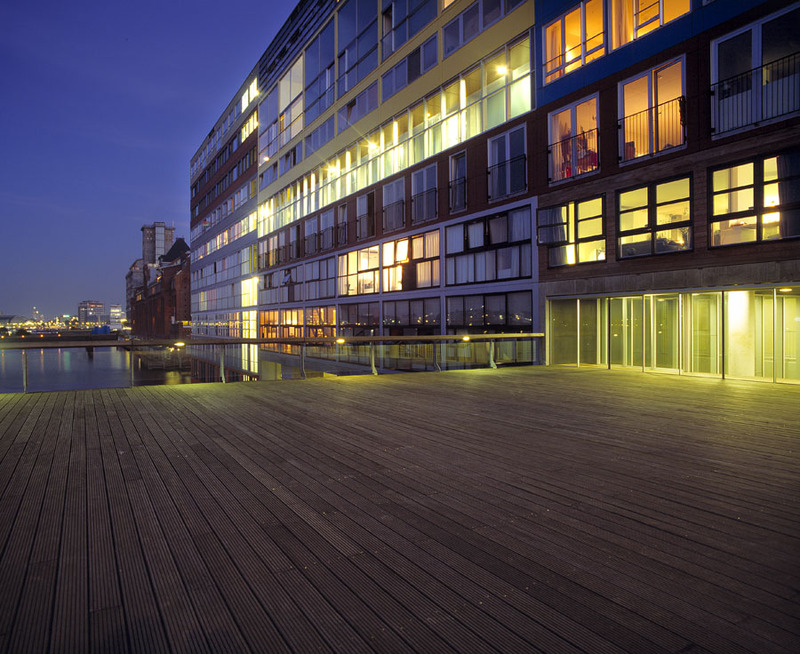 The opening in the Silodam building in Amsterdam, which leads to a large square that extends out over the IJ waterway, can be interpreted in a similar way. While local residents felt that the erection of a building threatened their continued enjoyment of the IJ, the square ensures they do not lose out. In the case of both the Market Hall and the Silodam building, large publicly accessible squares are made and maintained by private parties. Such spaces owe their very existence to the construction of these residential buildings. Social segregation is a thorny subject in modern urban design. In the Silodam, all corridors and galleries are inextricably connected to one another so that (social) compartmentalisation in the building is impossible. Designing corridors and galleries in an adventurous and varied manner means that a walk through the building takes you past exciting spaces for playing and enjoying the views. Varying the access points in terms of scale and dimensions creates more small-scale, shared spaces that are linked to the various housing typologies and thus to groups of people living in the building. Lacking a designated, predetermined function, these shared spaces stimulate all sorts of activities that cannot be envisaged in advance by architects. The large open spaces on the upper floors of the Silodam act as public areas for the building’s residents. In many cases the square-like openings and passageways also read as differentiating urban features that are legible from a long distance and lend large buildings a distinct identity. Berlin Voids Silodam, Mirador Parkrandgebouwen. A next stage is the addition of gardens and collective amenities. (Torre Huerta Sociopolis). As far as diversity of housing typologies is concerned, it is wrong to think that individualisation inevitably leads to the atomisation of social life. Despite the unbelievable variety in lifestyle, taste and levels of wealth, and the desire to distinguish oneself from others, people tend to align themselves with like-minded people in the same position. For years, Ellie Uyttenbroek and Ari Versluis have documented this phenomenon flawlessly in their Exactitudes series of photographs. Within a strict framework they look beyond the images of what they call “the apparent discrepancy between individuality and uniformity”. The beauty of their project lies in its endlessness. Every day throws up new variations. Think of this in relation to our living environment, and you could say that making various typological groups is not such a strange idea. All sorts of select clubs emerge within a building, each of which appeals to people with shared interests. It is a new form of collectivity. The resulting diversity in housing forms can be translated into a large residential building in various ways. A very spacious dwelling that can be inhabited in many ways is reserved for the privileged few, so it is worth exploring what use of space can occur with limited dimensions. Perhaps by giving a dwelling a distinctive character that, on account of its form, has to be conquered and personalised by its occupant? Or perhaps a dwelling without characteristics, one to which ingredients can be added as desired? This already happens, since the first thing many Dutch people do when they buy a home is alter the bathroom and the kitchen. The same principle could be applied to more aspects, from the interior layout to the facade. The contractor completes an intelligent shell in which the structure and installations do not limit the possibilities for layout variations too severely. Rodovre Skyvillage Unfortunately, more than fifty years after the publication of John Habraken’s book Supports: An Alternative to Mass Housing, this method encounters many obstacles in the world of construction. Even so, it is still the solution that we should work towards. It is certainly an enduring concept, not only because it accommodates changes in taste but also because it is more enduring over time. Until the time comes, however, we can try to increase the range of variation as much as possible. And by doing it within one and the same building, we can ensure a mixed population. After all, why would you want differentiation within a neighbourhood but not within a residential building with more than 150 housing units and over 300 residents? Changes in how we live influence not only our homes themselves and the composition of residential blocks, but also the amenities we wish to find nearby. Such amenities are those that cannot be realised inside the home, but are affordable when offered to a larger group of people. Facilities such as fitness clubs, swimming pools, shared guest accommodation and child-care facilities, and also services such as laundry, meal deliveries, security, personal care, medical help for seniors and so on. Various amenities could be articulated within a building (gebouw Jakarta), just as public buildings in the city stand out because of their form and appearance. All these hybrid buildings full of collective amenities could be linked to one another by elevated bridges and tunnels, resulting in a truly three-dimensional city. This would prevent residential buildings from becoming urban enclaves or ghettos, and prevent cities from becoming places with gaping contrasts between rich and poor. Instead of every building containing exactly the same amenities, or some buildings offering everything and others nothing, buildings and their occupants could exchange services among one another. To realise this, spaces and places are needed where people can meet, where extra services are available or exchanged. 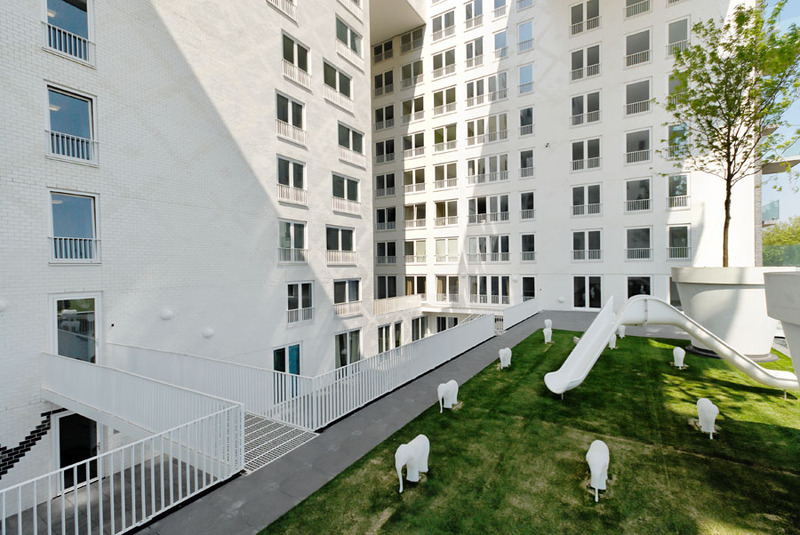 In each large building we should be able to incorporate a number of unspecified spaces that are accessible to the public and the property of all residents together, spaces with external structure and installations that facilitate connections with other units. Since working together and sharing fulfil the primary necessities of life, new collective spaces are not for theoretically social groups forced to meet in public wastelands, but genuine associations of people based on collaboration and cohabitation, people who share and supervise privatised spaces, tasks and functions. The social ideals may be more pragmatic compared to the 1960s, but more than ever before they are prompted by the necessity of living — and working — together in larger and smaller groups to enhance our residential environment.